Getting logged in: The Desolation MUD wiki has some links to recommended mud clients, however you will need to connect to port 4201 instead of what it says on that page. Old characters: We have many old player files, however the old passwords are incompatible and need to be manually reset by an admin. Either follow the contact info on the login screen or nag me in game with a newbie! Great news everyone — I am running out of problems to fix! Last night the Qajip desert was brought back online. Most of Deepingdale has been scouted out for broken stuff. A lot of old weapons and armor had problems caused by printing special messages to the room when equipping “Soandso wields the mace and looks ready to crack some skulls!” — This caused errors when being equipped by monsters that weren’t in a room yet (because they were being spawned in). Eventually I fixed this by wrapping the message efun with a simul_efun that checks if the message target exists. This single change knocked out more errors than any other. The remaining errors out there are usually keyword problems such as “new” or “class” being used as variables in special item code. There has also been a few rounds of cosmetic polish added to the starter village of Rotwood including new npc emotes and greetings as well as some signposts around town to help you find your way to various destinations. There is also a “recall” command that will teleport you to your start location from any broken room. This is becoming less and less useful. Also over the week/weekend I got involved in something much sooner than I wanted to — fixing combat problems. Firstly, some class abilities such as rogue’s slash, fighter’s aim, execute used a basic spell extension of the combat system. This was causing slash for example to print “Your powers fail you.” when you got a missed attack. You can still miss, but now you get a more melee appropriate message — and it is no longer using your Intelligence stat to do the hit calculation for these older style abilities. Additionally, as you would expect, armor provides a reduction in the damage you take, however there was an invisible issue in this due to integer precision. The way that it was set up, armor was supposed to provide 1.5% damage reduction per point of AC, but was only providing 1%. I have converted the damage code to use floating point numbers and then round the final result at the end so that you actually receive the full benefit of your armor. The mage ‘feed’ command had a similar issue. It was not supposed to give you a feed that gave no mana and no healing back. I effectively doubled the amount of mana that it gives and it is now always returning mana — however it still seems fairly insignificant. The mud is up and running at desolation.org, port 4201 ; Deepingdale still needs a walkthrough and password recovery is manual for now. Not all commands/abilities are ready, but the game is playable especially in the starting areas. Contact me if you would like back into your old characters. All function pointer problems have been resolved, wolfwere shadow object now works, intermud 3 repaired, changes to the inventory command, fixed and slightly colorized the missile spell. I also fixed a problem with the advancement daemon where level 2 cost more than level 3 (because you had “pay back” level 1), the leveling curve should be smoother now. 3/19/2012 Update — I received a copy of the mud from Chewdog and Chugach on the 16th and am in the process of bringing it back up. I currently have the mud running under a much newer driver (FluffOS instead of the older MudOS). There are 1,850 items/rooms left that need function pointers fixed. (There were 8,700 function pointer errors to begin with.) This is down to set_items and some oddball stuff like set_read, set_struck, etc. Commands need to be checked for bugs. Most direct damage abilities have variable redeclaration errors. Incompatible include paths in monsters/rooms/objects. Caused by wizards using #include <mydefs.h> instead of #include “mydefs.h” Hopefully I can fix this without editing all the effected files. Build a password recovery system, and mail old players. 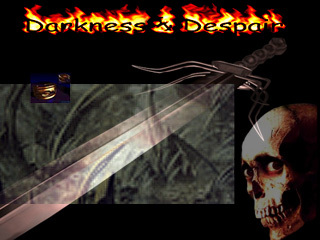 In the mid 90’s I used to play on a MUD called Darkness & Despair. 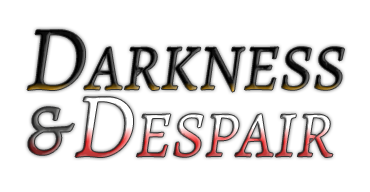 When I started playing, it was originally hosted at dnd.europa.com:4201 where the administrator was Vyle. At some point here, Vyle stepped down and Wulfgar took over hosting/administrating the mud. I mostly played a Minotaur Warrior (Anti-Paladin) named Spine-Snapper, but I also had a Rkpathkre Cleric? that was a Creator for a bit. Darkness & Despair – Logfile from 5/18/1997 – In this I appear to be doing a round of approval on Grazzt’s area, then discover Loki and Wulfgar were tweaking/twinking their characters. So much drama! with a minimum of interference from the Arches and Immortals. This mud will definitely get your adrenaline flowing. Want to kill without the fear of a prison sentence?? weaknesses with specific classes, and newbie land was made easier. Come take a look! And welcome back! I’m not sure what happened with this version of the mud. Chugach reports the cipollo.ugate.net version was up for a few more years. A copy of the lib was left with Loki, and a group of old players picked up the original server the MUD was running on, but never got the mudlib recompiled for a new server. Recently Chewdog/Hellspawned got the old test server from Chugach and near the end of 2011 and got it running on a cloud or virtual machine at dnd.gatewaymud.org:5201. At some point recently this went down, and Chewdog has been unable to get in touch with the host here. Before the MUD was called Darkness & Despair, it went under the name of “Out of Balance”. As far as I can tell, DnD was largely a stock Nightmare 3.2 mudlib. Rkpathkre – The Rkpathkre were a ugly misshapen race with a 3rd stunted arm growing out of the middle of their chest. It was a fatal limb, as it was supposedly connected to their heart. The Rkpathkre diety was Rknamor? Their special ability was basically sucking. Windwalker – I don’t remember these guys, but there is an old help file about them below. mysticism has allowed them to progress beyond needing pure physical strength. enough to impose their vengeance upon those who cross them. The windwalkers venerate the mighty god Vascholl. Their primary language is Arrenian. Wolfwere – They had the ability to transform between man and wolf forms, and were a popular choice for the monk class. Yuanti – The Yuanti were a race of snake-men that had the ability to do a spit attack. After a certain level, and typically a difficult and secretive quest you could unlock a additional prestige class. Fear: Properly trained psionicists are able to sense their opponents worst fears, and project those fears back at their opponents. This fear causes your opponent’s heart to skip a beat or two, which not only hurts you opponent, but causes your opponent to become preoccupied with their terrors. Project: This ability allows you to leave your body and travel in astral form. While in this form, you are totally unable to physically or magically affect, or be affected the outside world. Nondetection: Nondetection is the ability to lock your mind so tight that it becomes impossible for people to locate you through any means short of being in the same room as you. Stats were increased by spending experience points via the ‘Beseech’ command, which would bring you before your racial deity to buy adjustments. Each race had different weight costs. Oxide/Halide/Brightshadow? – my friend Scott. I think he played a gnome mage. Kinslayer/Pe’Ell? – Kinslayer was his assassin character. I think Pe’Ell was a wolfwere monk. Zaknaifen (Arch) – cre who had built some horrible evil tower. At the top you could fight a mirror image of yourself. There was also a Medusa and some lethal traps on the way up. Wulfgar (Admin)- I think he took over the mud after Vyle, but I think I remember hearing that he had died? Yildor (Arch) – another arch wizard. I remember him being cool, but I don’t remember why. Loki & Nex the Lord of Death – mentioned above in the windwalker class description. I remember at some point he was the law arch? Member of the Syndicate. Raven – I don’t remember much about this guy, except that he visited Portland and we saw a film at Cinema 21. I think he may have later left for Zhing! mud. Kate – Prominent and prolific creator who built a lot of areas that left the game when she left. She went over to Zhing! mud. She was an area approval arch. Money was fairly easy to come by, and rampant mudflation was a problem. The Brotherhood / Brotherhood of Virulance – The guild I was in, first created by Vyle. Their hideout was a shack north of Deepingdale, guarded by a shadowy figure. People would break in and deface our message board, unaware of the evil temple below. The Ancients – All I remember about these guys is they didn’t like my guild very much. The Syndicate – These guys had a windwalker who would wander the mud picking up dropped items and depositing the proceeds in their guild bank. Newbieland? – The huge starting area, that you couldn’t go back to once you left it. Deepingdale – The main city. @@@@@@@   @@@  @@@|@@@@:~~~~~~~~~~~~~:::@@@      calderra mts. I managed to find a zipfile of my personal files from my stint as a Creator on the MUD, it’s not much. This mainly has my personal effects, some area proposals, the hidden rooms and guild items for the Brotherhood, and an unapproved extension area to the main city of Deepingdale.